Frances M. (Billie) Richardson received a B. S. in chemistry from Roanoke College in 1943 and an M. S. in chemistry from the University of Cincinnati in 1947. From 1943 to 49 she held several chemist positions. From 1951 to 1980, she held post ions as research associate and then research associate professor in North Carolina State University’s Department of Engineering Research. She was the first woman faculty member of the College of Engineering. She was also the first president of the North Carolina Society of Women Engineers. From 1980 to 1983 she was associate director of NCSU’s Engineering Operations Program. After working in the dean’s office of the College of Engineering, in 1990 she joined the faculty of the Department of Biological and Agricultural Engineering as a professor of Biological and Agricultural Engineering. 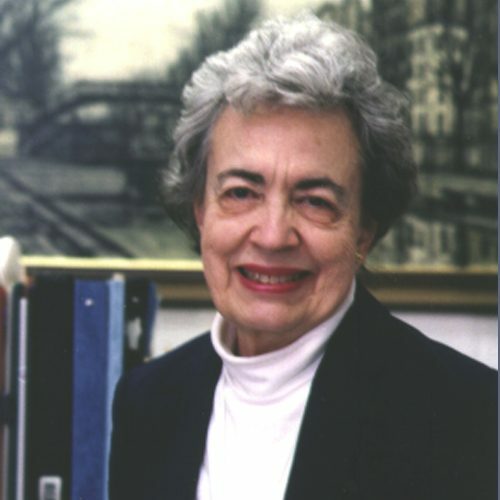 The first person who comes to mind on the subject of women engineers is Professor Frances “Billie” M. Richardson. She is a first in many ways. Richardson is both BAE’s first female faculty member and emeritus faculty. Forty-one years at NCSU and five years at BAE, she was the only woman faculty member in the College of Engineering for twenty of those years. She says, “I never minded working with men; it was always about the research and learning for me — as it should be.” With her degrees in chemistry, Richardson has pursued and imparted her knowledge in several engineering areas such as chemistry, physics, nuclear engineering, and currently, biomedical engineering. Richardson was the first to note a strong student interest in the biomedical aspects of engineering, so she took a year’s leave of absence to work and learn at the well-known Department of Biomedical Engineering at Case/Western Reserve. On her return she taught biomedical engineering within “Special Topics in Chemical Engineering” and taught an elective course, “Introduction to Biomedical Engineering.” The latter attracted a steady flow of students, many of them women. Richardson joined the then all male BAE department faculty in 1990. Her research interests complemented other ongoing department research and so did she.